Whisk eggs and ice water together. Add flour and whisk briefly; mixture should be lumpy. Dust the oysters with a little extra flour, dip into the batter and shake off the excess. Drop into hot oil and cook for 3 minutes. Remove and drain. 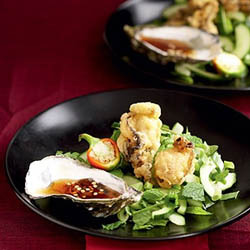 Chilli and lime dressing: Mix the ingredients together and pour into oyster shells.